The purpose of canting the front foot is twofold. The primary goal is to restore range of movement to the ankle joint that has been lost due to geometric differences between the boot shell and your body. The secondary goal of front foot canting is to fine-tune the effect on knee location created by raising the toe of the binding. This effect is minor, however. In order to effectively stand on one foot, your center of mass, located around your navel, must move laterally until it is over your base of support. (Assuming you are more or less stationary) Simultaneously, the tibia and fibula move sideways in the same plane. If the sole of the boot rests on a flat surface, the lateral side of the boot cuff becomes a fulcrum against which the fibula rests. The resulting leverage forces the ankle joint to collapse against the medial side of the boot, compromising joint mobility, increasing overall muscle tension, and causing some rotation of the body. If you tilt the binding correctly, the mobility of the ankle joint will be restored. Standing one-footed on a properly canted binding, the rider will feel a distinctively ‘stacked’ sensation, without a tendency to rotate in either direction. The binding in the left photo is flat. The binding in the right photo is canted. Cant values are specific for each athlete, and may vary from one leg to the other. If the foot is not properly supported by a quality footbed, and the cuff has not been aligned, an absolute degree of cant is difficult to determine. The desired effect can be achieved, but should be reevaluated if foot support is improved, and cuff alignment is revisited. 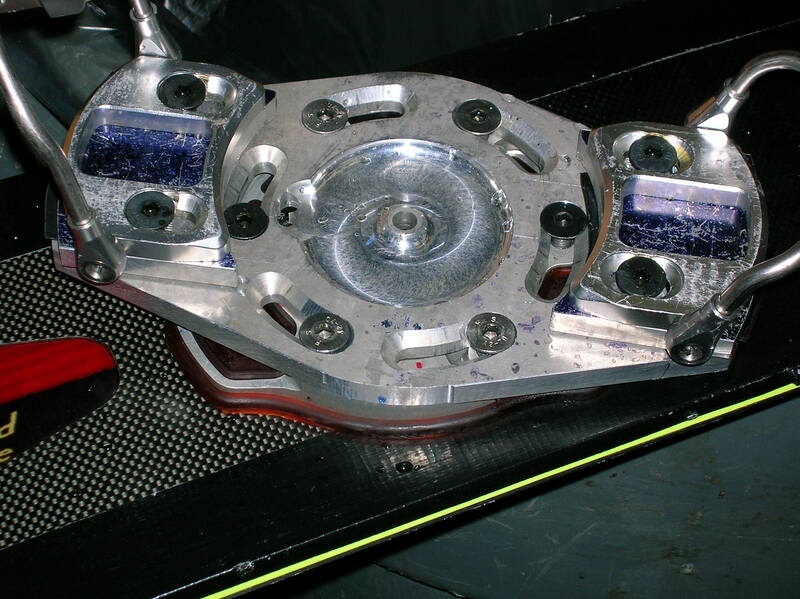 On the TD1, the cant value can be changed using longer pad mounting bolts and spare change (or washers) to tilt the pad. A more permanent solution is to use pre-made cant shims used for canting alpine ski bindings. 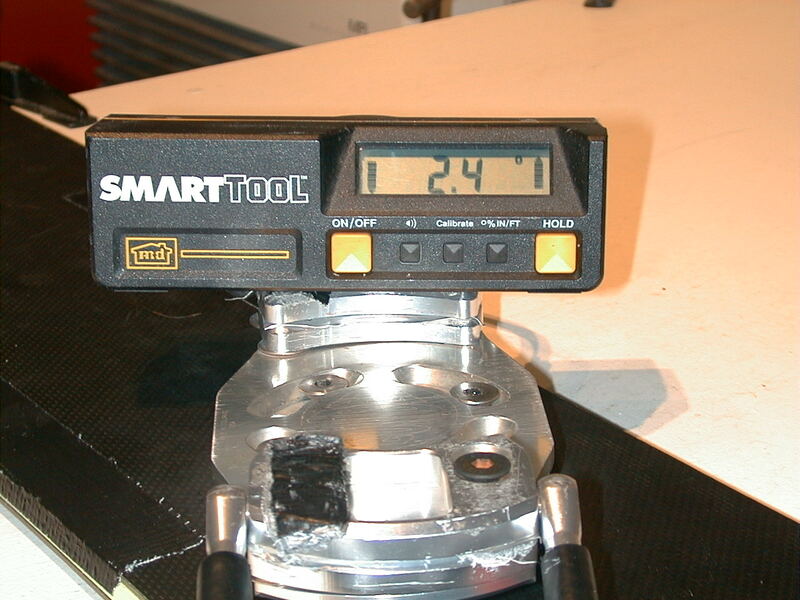 Strips of duct tape can be used to fine tune, though the tape will soon compress and require replacement. If you are fond of the TD1, determine the cant and lift that you want, and I or another machinist can make you a disc. If you use the TD2, you may be able to get the necessary cant value, but it may come at the expense of toe lift and vice-versa. Without making a few of my own parts, I am not able to get what I need from the stock TD2. If you use CATEK bindings, you can simply turn the jackscrews one way or another. Fine-tuning with tape will not work with step-in systems unless you put it between the base plate and the toe/heel pads. If you are using a binding that is not as rigid as either the CATEK or either TD model, you will not realize much fine tuning ability, as the boot will not be held securely enough to make that much of a difference. The same is true if you have rubber toe and heel blocks on your boots, regardless of whether you have Inteks or conventional closures. However, gross adjustment is still important to find the best possible static baseline. I found that the stock TD2 mid-plate, combined with small-ish toe and heel blocks, allowed for too much flex. 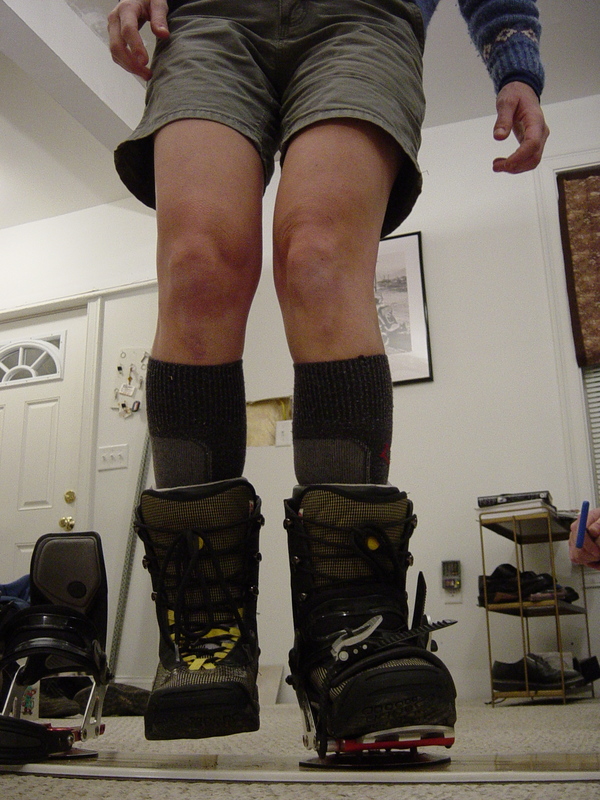 Therefore, I could not get my front foot canting correct in both directions (toe and heel side) once I got on hard snow. The solution, shown in the previous photos, was to make a stiffer mid-plate that would accept the larger toe and heel blocks of the TD1, along with larger fasteners. As the larger bolts are not proprietary, I could use longer bolts and cant material for fine-tuning. At this stage of the game, if the front foot is set up properly, carving a turn one-footed on easy terrain should be a piece of cake. Unloading from the lift and riding across cat tracks on one foot should be as easy as sneezing. You may even be able to ride switch on one foot, (on gentle terrain). In only rare instances is it appropriate to cant the front binding with the higher side to the outside of the foot. If you are bowlegged, this might work. Otherwise, forget it. Joint mobility will be lost, and you will have to ride out of the upper body. Of course, if you want to ride with a wide stance, scrunched up into a wad, and leave the hill exhausted at 11am, go ahead and cant your bindings inward. Got a speed wobble on the heel-side turn? Front quad remind you of Chernobyl? Care to guess why? (Hint: It doesn’t have anything to do with your hands). 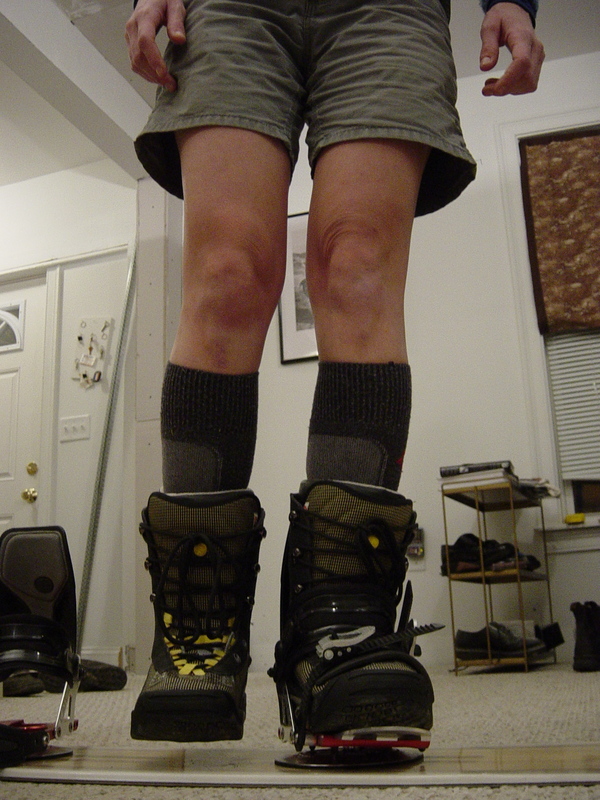 Every so often some wit will inform me that snowboarding is done on two feet, not one. I suppose this argument clarifies the difference between knowledge and wisdom.